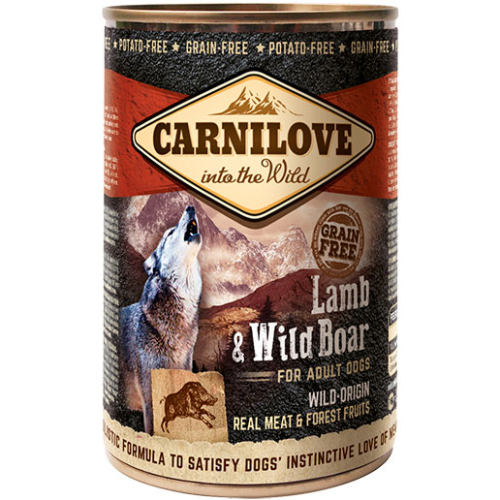 Lamb and wild boar are an excellent combination of quality, highly digestible, usable proteins rich in natural nutrients. Lamb is a source of selenium, iron, zinc, B vitamins, and unsaturated fats. Wild boar is packed with proteins yet contains little fat, making it ideal for maintaining optimum physical condition without the risk of increased blood cholesterol levels. 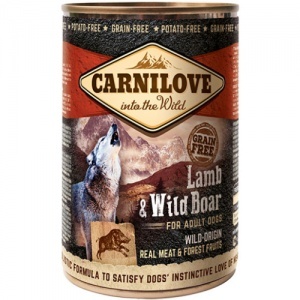 Ingredients: lamb (35%); wild boar (32%); blueberries (2%); cranberries (2%); raspberries (2%); minerals (1%); salmon oil (0.1%). Analysis: crude protein 10.8%; fat content 6.9%; crude ash 2.5%; crude fibre 0.4 % moisture 75%.